Saddle Bar Stools are fun! Each Saddle Bar Stool is handmade from a real riding saddle. 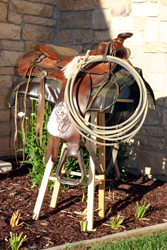 Each saddle includes rope truly used for roping cattle. If you ever get a chance to ride, each saddle comes off and is ready for horse riding. If you want a special height, just note it on your order. See ya pardner! If you put 10 stools in a room this is the first one they sit in. I know, I have them at home and at work.